Thanks to friend Lucy Quinlivan​ for sharing this. A lot of hard-working folks took Mr. Trump (“Trust Me…”) at his word that he’d take care of the little guy, “drain the swamp”, “Make American Great Again”, etc. A lot of hard-working folks also voted and elected Republican House and Senate members to represent them in Washington. Forgetting for the moment Russia, sexual assault, ethics, threatened nuke launches, etc. : If you voted for or currently support Mr. Trump, and/or the Republicans in Congress, and consider yourself “low-middle” or “middle class”…please read this carefully, put whatever “automatic retort generator” you have on hold, and tell me WHAT YOU THINK. 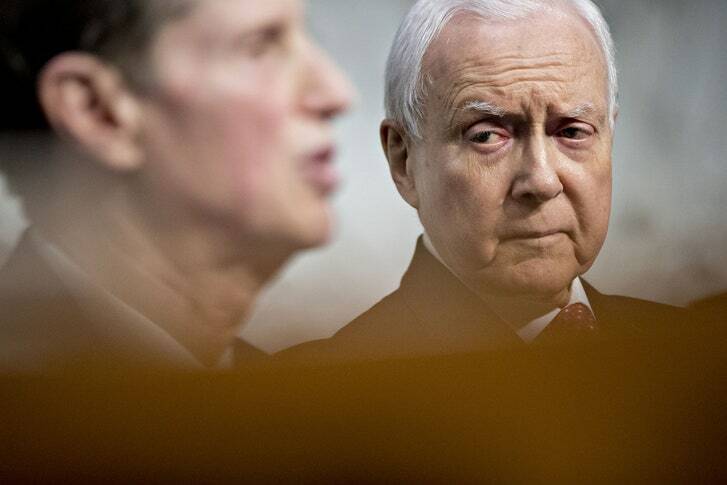 Senator Orrin Hatch, of Utah, co-chairs the Joint Committee on Taxation, whose reports this week make startling reading, or as startling as a series of spreadsheets of tax revenue data can be. Surely, we will have other debates in the future with thoughtful arguments on every side. But not this time. The numbers are in and it’s clear: this tax bill helps the rich and hurts everybody else. Just ask the very people who wrote it. The U.S. Congress Joint Committee on Taxation is run by the chairs of the House Ways and Means Committee and the Senate Finance Committee—Representative Kevin Brady and Senator Orrin Hatch, respectively. The Joint Committee’s reports of this week make startling reading, or as startling as a series of spreadsheets of tax revenue data can be. The report shows that this bill is much like a teaser rate on a new credit card: there are some goodies in the first couple of years, but those disappear fairly quickly, at least for those below the median income. In 2019, the first full year that this bill would be law, the benefits are concentrated on the bottom of the income stream, with middle-class people, on average, paying just under ten per cent less in taxes than they would if the law weren’t passed. With each passing year the benefits shift upward, toward the rich. By 2021, those making between twenty thousand and thirty thousand dollars a year are paying considerably more in taxes, those between thirty thousand and two hundred thousand see their benefit shrinking, and those making more start to see their taxes falling. By 2027, every income level below seventy-five thousand dollars a year sees a tax increase, while everybody above that level sees a continued decrease, with the greatest cut in taxes accruing to those making more than a million dollars a year. The report shows that the rich benefit and the poor are hurt in every way that it measures. For example, the effective tax rate—meaning the percentage that people, on average, actually pay after they take all deductions—changes in a precisely regressive form. The poorer you are, the higher your effective rate will rise. By 2027, only those making a hundred thousand a year or more will see an actual cut in their effective tax rate. And, as could be expected by now, the more they make, the greater the cut in their effective rate. By 2025, there is a direct transfer of money from the poor to the rich and corporations. This is not a flaw but the whole point, Harvard’s Martin Feldstein argues. Feldstein is, arguably, the single most widely respected Republican-leaning scholar of tax policy, and one of the few academics who came out in favor of the bill, in a Wall Street Journal op-ed. His defense, though, should not give much comfort to the bill’s proponents. He argues that cutting individual tax rates won’t increase economic growth and will add to the deficit—which, he acknowledges, is a bad thing. But he’s so excited about the corporate tax-rate cut that he thinks the bill should pass nonetheless. This is an odd stance, since the corporate rate cuts are about a third the size of the individual cuts. That is the state of debate on this current bill. Its most respected defender acknowledges that three-quarters of the benefit are a wasted, harmful gift for the rich, but a quarter of the benefit goes to corporations, and we must assume they will spend it wisely. In 35+ years in media I’ve never been what you’d call “star struck”. I’ve met a lot of celebrities and gained access to some remarkable locations, but never asked for an autograph and RARELY took a photograph. That being said, I have ended up in some pretty remarkable circumstances. This week’s passing of Dennis Banks, aged 80, Native American activist, author, educator, actor and central player in the 1973 occupation of Wounded Knee on South Dakota’s Pine Ridge Reservation, brought back perhaps the most unusual. In February 1985 I had just turned 24 and was the morning radio host at KIOV-FM 104.7 in Sioux Falls, SD. A few months prior, Dennis Banks had ended 11 years in California and New York avoiding prosecution for his involvement in the burning of the Custer County Courthouse in Custer, SD, which preceded the world-famous occupation of Wounded Knee in 1973. Banks surrendered himself to SD authorities, and was sentenced to 18 months in the SD State Prison in Sioux Falls. After all those years on the run the world’s media wanted to talk with Banks. As I remember, he accepted two media offers. One was with French Television. The other was with KIOV News Director Jerry Dahmen, who was also stringing for NBC. After the interview Jerry casually asked Banks how he was spending his time in prison. Banks said he was leading a group of Native American prisoners dedicated to living a life of traditional diet, study, spiritual practice…and basketball. Jerry told Banks the station has a basketball team of its own, and wondered if the Banks-coached Native prison team would be interested in a game. Arrangements were made, and a game was set for February. There was only one problem: KIOV DIDN’T HAVE A BASKETBALL TEAM. However, the offer had been accepted, so we had to come up with something, and FAST. We scraped together five volunteers who I think included GM Don Jacobs, Farm Director Tom Lyon, announcers John Jacobs and Dan Iseminger, and me. I also made an impassioned call to my long-time friend Lee Erickson in the Twin Cities with an offer he couldn’t, and didn’t, refuse. So the Saturday in February arrived, and our rag-tag 6 met at the Pen. We changed into short pants and sneakers in an unused room at the prison, were lead through a couple of cell blocks, past the cafeteria, down a long tunnel, emerging in a cavernous, double-wide underground gym. There was one way in, and one way out. To our left was a boxing ring where two inmates were punching the bejesus out of each other. On the opposite side was the court, where 15 or so highly conditioned and disciplined Native young men were warming up. The crowd was very sparse. Program Director Reid Holsen, News Anchor Lori Scheel Martell and my brother Mike made up our cheering section/gang. A few dozen Native inmates were seated behind Banks and their bench. During the shoot-around I took a minute to stop, shake hands and introduce myself to Banks. As a 6th grader I’d followed Wounded Knee on TV and through the Weekly Reader (true). I don’t know if it was the nervousness of meeting this genuine historical icon, or the impending thrashing we were about to take on the court, but I have no memory of what I asked him or how he answered. Thoughts quickly returned to the contest when from one end of the court emerged about a dozen Native prisoners and a drum. The BIG drum. The 12 spread out around the instrument and began playing and singing. The deafening emotional echo of the two gyms only magnified the power of the song, and our sense of dread, now in full flower. We stayed with Banks’ team for about one quarter. Then every five minutes or so a fresh five would come off the Banks bench and RUN, RUN, SHOOT and then RUN some more. They were gentlemen throughout the game, and showed us skill and exceptional sportsmanship by only doubling us up 120-60. We considered it a moral victory that none of our “Iron 6” barfed or suffered cardiac arrest until after the final buzzer. A camera crew from KDLT-TV shot the event. Somewhere, all that remains from that day is a short TV story including me in short gym shorts and a fuzzy white-guy semi-afro talking with possibly the world’s most influential Native American activist inside an underground prison gym in South Dakota. However, from that point forward, whenever my friend Erickson and I got up a pick-up game with some dangerous dudes on an inner-city playground, we were quick to let them ALL know the skinny white dudes they were about to tangle with had played PRISON BALL WITH DENNIS BANKS FROM THE INTERNATIONALLY FAMOUS ARMED OCCUPATION OF WOUNDED KNEE. You can’t make it up.